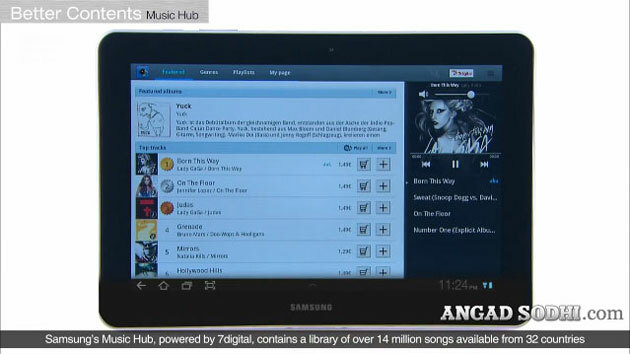 In my last post we saw Samsung unveil the new Samsung Galaxy Tab 750. While I was not very impressed by the first Galaxy Tab (I’ll tell you why in a very short while), the 750 in its all new avatar has simply blown me away! We are gonna go through a few of the features that really stand out. I have to admit, I am never really amazed by how much Gigabytes of storage a handheld has or how fast it’s processor is. It doesn’t really bother me that the 750 only has a 3MP rear camera. The reason being that it is safe to assume that these numbers are bound to grow over the months. In a few months time we’ll probably have 3Ghz dual core processors in cellphones. Its a given. Plus, do you really want an 8MP camera on your tab?? The first Galaxy Tab was ugly to say the least. It was bulky and so very Nokia-ish (I hate Nokia phones BTW). It was 7 inches diagonally and 12mm thick! It was neither a smartphone (obviously there’s nothing smart about a 7inch phone) nor a regular tablet. Samsung thought they had come up with a brilliant device, but they had not. Well, now they have! Doesn’t it look just amazing!! I know it looks very similar to the iPad but it is still much better than their last Tab. 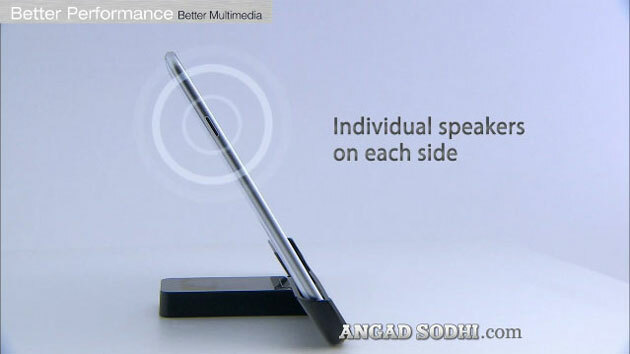 The Galaxy Tab 750 also has dual speakers neatly tucked into the sides. Always good to have dual channel surround sound on a handheld. Given it’s looks the Tab is definitely gonna turn some heads around. Why this is a feature I really liked is because even though a little late, Samsung finally have the slimmest and the lightest tablet in the market. Also having the best screen and biggest battery out there is a plus! Tablets try to hit that sweet spot between cellphones and laptops (desktops are almost a thing of the past now). 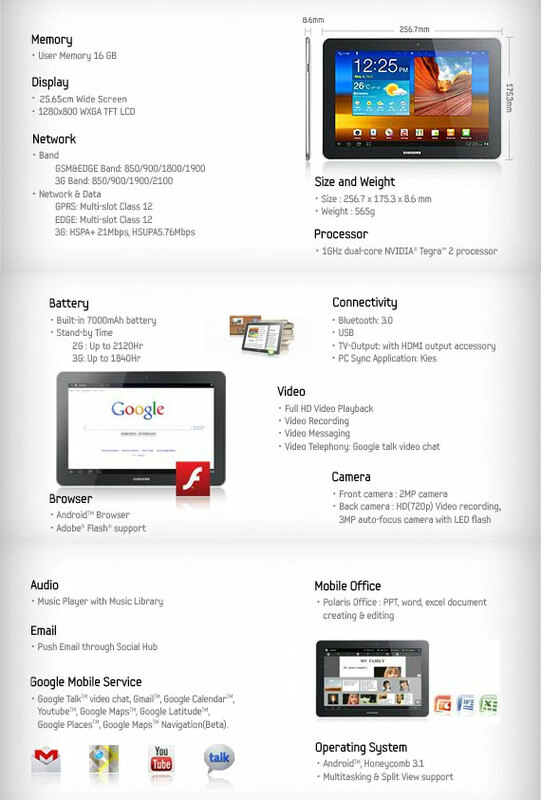 You know Samsung have done just that when you look at all the accessories they have built for the Tab. 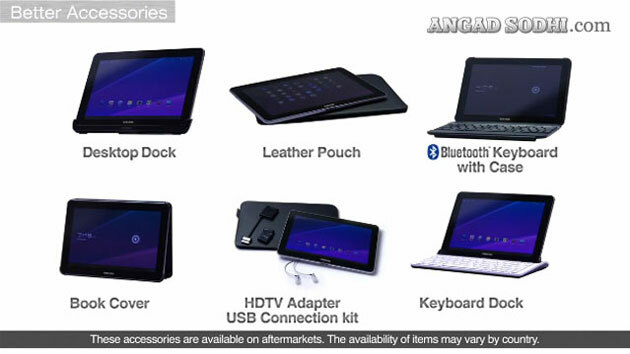 Apart from the leather pouch and book cover, they have also built a bluetooth keyboard, a dock with a keyboard of it’s own, a regular dock and an HTML adapter kit (they have to be purchased separately). Now you’ll never have to bother about buying expensive accessories from other companies and worrying about compatibility and connectivity issues. Why do I consider this as an admirable feature? Because it shows that Samsung gets the bigger picture and that it cares about their user’s needs and is doing everything it can to fulfill them. 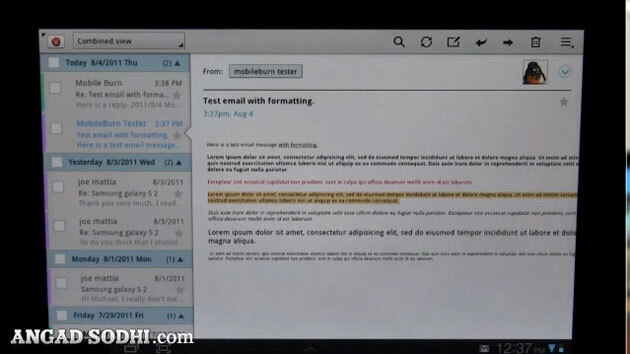 Android 3.1 Honeycomb brought about true multitasking. It is a little hard to believe previous Android devices didn’t really multi-task, but check out screenshots below and you’ll understand. Presently there are 6 mini-apps that can work on top of (alongwith would probably be more appropriate here) other applications. 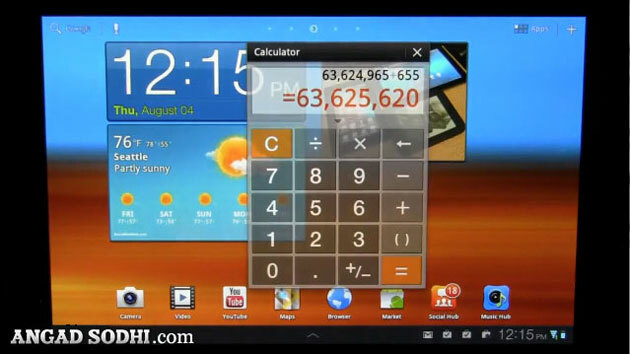 You could be working on your spreadsheets while having your calculator on top! Multi-tasking can really boost your productivity. I’m telling you, very soon you’ll be tempted to chuck away your laptop for this tablet! 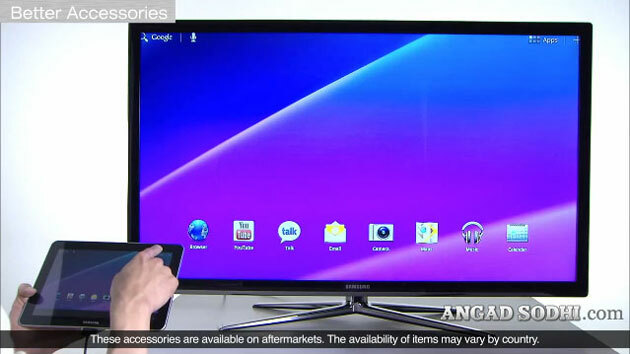 Widgets on the homescreens are customizable! It comes as a great relief to me. Earlier phones had widgets that would take up the entire screen. It doesn’t really make sense having just one widget on one homescreen. Wouldn’t I simply use a full fledged app instead? I had raised this question to the tech lead at last year’s blogger meet for the Samsung Wave and Galaxy S and they didn’t have an answer then. Some widgets will just shrink/expand in size while others behave differently in at different sizes! Cool eh? There are a whole bunch of other nifty little improvements that make the overall experience pleasant. Customizing homescreens just got better! 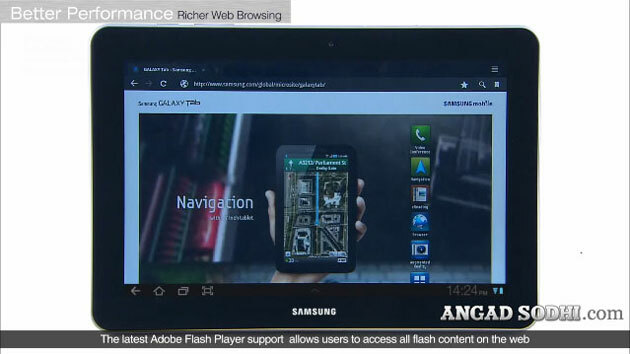 The browser supports full flash. I tell you, the Tab can easily replace the laptop in the near future! Even the Government is going paperless. It's high time we did our bit! A bigger screen is like more real estate. Neatly spaced out email client means that you wont be missing your computer. The revamped YouTube app looks kickass! 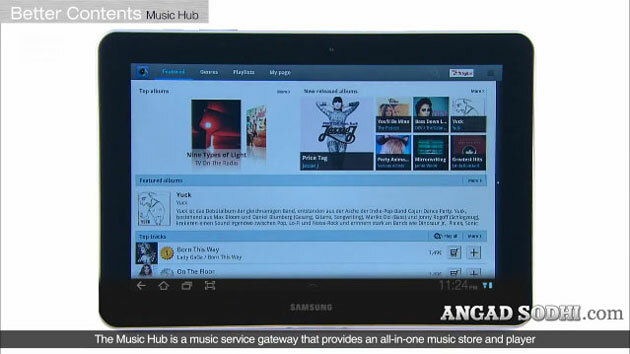 The Music Hub lets you listen to all your music as well as acts as a music store that lets you preview songs and buy them directly! Smart, I say! Here is why I am so excited by the new interface. Although it has only subtle changes from the vanila Honeycomb interface, all those changes are those which a lot of techies have been demanding over the past year. 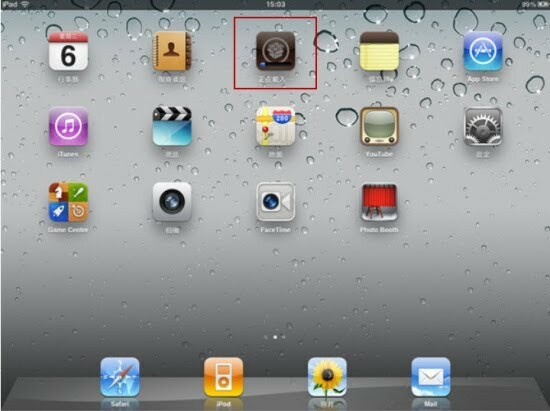 But to really drive home the point, we’ll also look at the iPad2 interface. Eermm.. There is nothing much to talk about really. It is just a bunch of shiny icons that launch apps. There is nothing much to it. 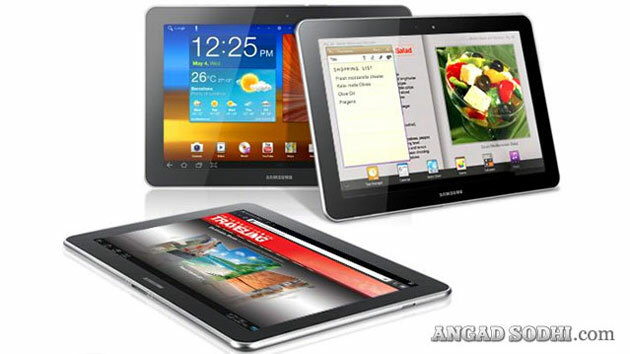 The reason why I would prefer the Samsung Galaxy Tab 750 to the Apple iPad2 is because while the iPad arrogantly screams “Buy me now. I have lots of flaws. But next year there will be a better iPad that will have fewer flaws. Buy that one then”, the Galaxy Tab humbly calls out “Buy me and you’ll never regret”!! 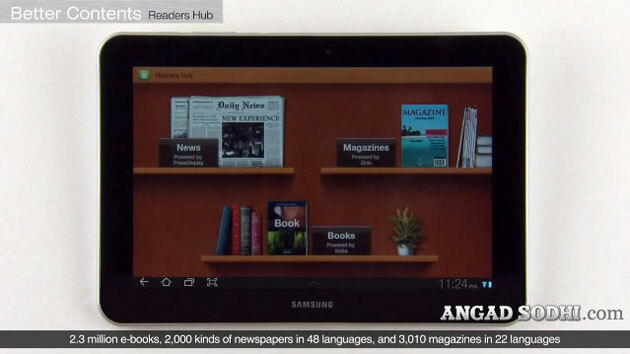 In case you missed the live launch of the tab, you could even watch the recorded video on youtube. Psst: This blog is on the verge of a major revamp! If you liked this post, subscribe to full feeds or join me on my Facebook page. Posted in Little things that catch my eye!! You have really worked hard, you have taken the snapshots from video, really an innovative work! Howdy! I just wish to give a huge thumbs up for the great information you may have here on this post. I shall be coming again to your blog for more soon. has the WOW factor, but again no to samsung .. !!!! Samsung has learnt a lot from their latest high end smartphone Galaxy SII and designed the Galaxy 750 Tab giving more importance to the slim factor. That adds to its classy and eye-catching look which drives the consumer crazy. 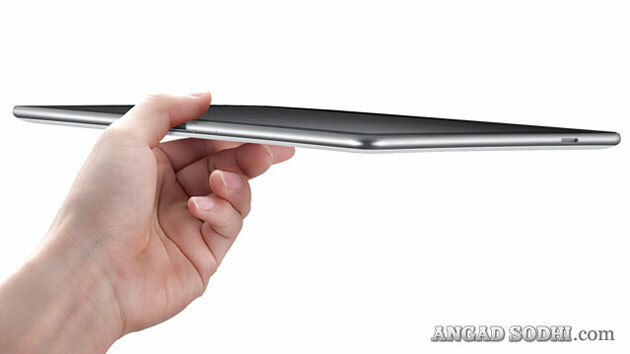 The new Samsung Galaxy 750 Tab is thinner when compared to Apple iPad 2, it is around 8.6mm whereas the iPad 2 is 8.8mm. 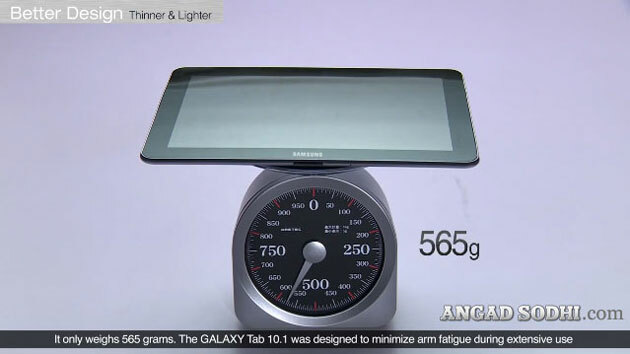 Definitely this 0.2mm difference is not a big deal can be only measured by Vernier scale, but it adds to the attractive features of Samsung Galaxy 750 Tab. How good are its MS office functions? ie, – opening/ modifying creating word, excel or powerpoint files.